LAFAYETTE, Indiana – To understand and fully appreciate the new Legacy, you have to know that the rock stars at Subaru are their engineers. It’s not the stylists, not the accountants, not the marketing execs and not even the marketing girls. This isn’t just my opinion. In fact, these are the exact words spoken by a Subaru insider, an employee of this singular Japanese automaker, at the launch of the remodelled Legacy, the company’s top-selling vehicle. These words were not uttered in an official speech, but rather stated unceremoniously in casual conversation. Also: 2015 Subaru Outback : We're Driving It This Week! The Subaru Canada team does things differently, and it’s for the best. They organized this presentation in Lafayette, Indiana, in the heart of the Midwest, instead of bringing all of us journalists out to the Pacific Coast for the umpteenth time (as their American counterparts did). The reason? It’s simple: the Legacy has been built in Lafayette ever since it launched in 1989. At the time, the plant was brand spanking new and a pioneer in both ecology and security. When we visited Subaru Indiana Automotive, they were building the first 2015 Legacy and Outback units, in addition to the Camry for Toyota, which is a partner and primary shareholder at Subaru. In 2016, it will give up its place to make room for the new Impreza with increased production capacity. 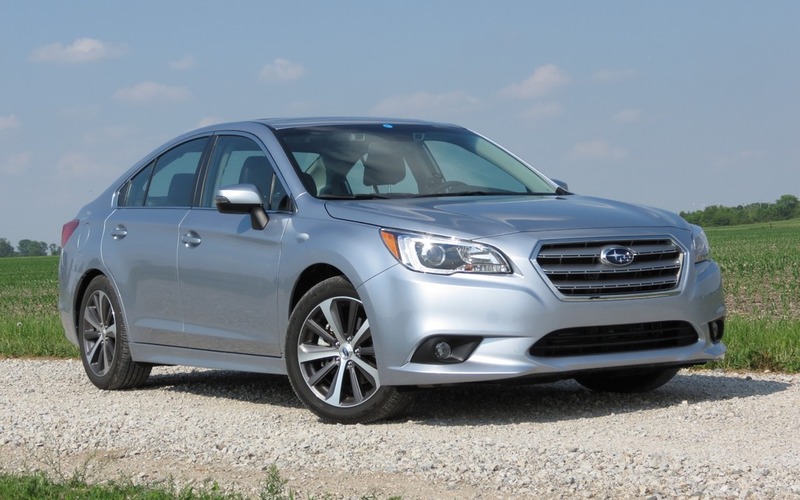 To mark the Legacy’s 25th anniversary, Subaru unveiled the sixth generation of this intermediate sedan, which remains one of the best designed, most reliable, safest and more interesting vehicles in its category. This is all the more true in our wintery country, whose vast road network is almost always in need of repair. We got to know the Legacy’s unique lines at its official debut at the Chicago Auto Show. Subaru wanted it to stand out and grab our attention, in contrast with previous generations that failed to turn heads. This was no easy task in a category that also includes the Ford Fusion, Mazda6 and Volkswagen CC. Nor was it going to be easy to reproduce the spectacular lines of the Legacy Concept showcased at the Montreal Auto Show. The production version of the Legacy is nonetheless very elegant, featuring an arched roofline and sculpted flanks. Its hexagon grille is larger than the ones on the new WRX and STI, but it also bears a striking resemblance to the ones on the Ford Taurus and new Hyundai Genesis (the luxury sedan whose base model sells for $20,000 more). So it’s flattering, but not necessarily original. The good news is that the man who oversaw the new Legacy’s development, Masayuki Uchida, previously worked as a designer and structural specialist before becoming Head Engineer at Subaru. The super skinny A-pillars, triangular windows and door-mounted rearview mirrors all amount to exceptional side visibility on corners. The bottom of the windshield is also set 50 mm forward, which improves aerodynamics, enhances esthetics and ensures a quieter ride. The new Legacy is 40 mm longer, 50 mm wider and just 5 mm lower. Its track is 17 mm wider and the wheelbase has not changed. The total cabin volume has increased by 45 litres while the trunk is up 8 litres. The passenger compartment and dashboard were redesigned and their fit and trim has improved leaps and bounds. The controls are well designed, logical, precise and comfortable to handle. The displays between the indicator dials on the standard 6.2-inch screen and on the optional 7-inch touch screen are modern and easy to read. All kinds of ports have been included for MP3 players and hands-free phones, with a storage cubby in the console for your devices. There are also plenty of other easy-access and practical storage compartments. In both front and back, the seats are more welcoming than in the past, without being too squishy. And all are heated. The driving position is adequate and all surfaces are supple and silky. Great work was done in this department. The new Legacy also comes with more accessories and safety systems than before. There’s a new air bag for your thighs, for example, but there’s also the third generation of the EyeSight system, whose new cameras are more compact and powerful. Also new is a very effective radar for rear cross-traffic detection. Most notably, the various functionalities of these optional systems are better integrated and less expensive. The body and chassis panels are thicker, while foam has been injected throughout to eliminate noise and vibration. The body’s torsional rigidity is up by 43% and the flexional rigidity has increased by 35%, allowing the Legacy’s engineers to modify its suspension and refine the settings for better road hold and handling. They also added a torque transfer system to correct understeer, as on the WRX and STI. The upper-end Limited versions also get new variable shock absorbers. And yet, the Legacy has only gained 20 kilograms, thanks to the prevalence of high-strength steel. Under the hood are the same two flat-cylinder boxer engines. They made several adjustments to the venerable 2.5-litre four-cylinder engine. It is now lighter, more fuel efficient and driven by a few extra ponies. Its city/highway fuel consumption rates are 9.0/6.5 litres per 100 kilometres, which is excellent for an all-wheel drive vehicle. I wonder when they will offer a more modern version with direct fuel injection for even better results. Finally, Canadians can still opt for a revised six-speed manual transmission, unlike our American neighbours. Otherwise, it’s the Lineartronic continuously variable transmission, to which Subaru has added virtual speeds to mimic the workings of a traditional gearbox and the climb and fall of engine revs during acceleration. These fake speeds may number 6 or 8, depending on the intensity of the acceleration. The CVT is now the only transmission available with the 3.6-litre flat-six. This makes this engine definitely better in terms of performance and fuel consumption. Its city/highway rates are a very honest 11.9/8.2 litres per 100 kilometres. So, just how exciting is the Legacy? Not very. It’s solid, stable, safe and comfortable – even on the bumpy and gravelly sections of the Lafayette plant’s test track. On the fixed-radius turns that connect the two 1.5-kilometre straights, the 2.5i proved a little more lively and agile. Its braking also had more bite, even though the front discs measure 294 millimetres in diameter, while those on the 3.6R measure 300 millimetres. Both have the same 300-millimetre ventilated rear discs, which marks a gain for the 2.5i. The fact that the 2.5i is about 80 kg lighter is significant since the front benefits from the lighter engine. The manual 2.5i is another 55 kg lighter. I am really curious to try it, especially considering this base trim sells for just $23,495, an exceptional price for an intermediate sedan with all-wheel drive, this level of overall quality and such a comprehensive list of standard equipment. The bill jumps to $24,795 with the continuously variable transmission. It’s the same story for the 3.6R, whose price ranges from $30,795 for the Touring to $35,395 for the Limited with the Technology Package, which includes the excellent EyeSight system, adaptive cruise control and a few other great features. The new Legacy models have definitely been designed and developed with tremendous care by the brand’s “rock stars.” As always with Subaru, their qualities are often as discreet as their appearance and only show their true value over several days and weeks. But this time, however, the Legacy’s charms were subtly noticeable right from the start. Just imagine how amazing she’ll be in winter, when you’re driving down the highway in a snowstorm and she’s right in her element. When it really counts. Spotlight on 2015 Subaru Outback : We're Driving It This Week!